As the first quarter came to an end in the 99th Grey Cup, the Winnipeg Blue Bombers were down 11-0 to the BC Lions, in a roaring BC Place painted orange with Lion fans. The Bomber faithful across the country were hoping that their team was setting the stage for a comeback after a slow start, much like they had done all season. The Blue Bombers were one of the lowest scoring teams in the first half throughout the year, winning the majority of their games in the third and fourth quarters — primarily due to their defence keeping the offence in a position to pull off some late game heroics. The Bombers did not disappoint in that regard. They made an attempt at a comeback after laying dormant for the better part of three quarters, scoring 14 points in the fourth quarter to bring them within one score of the Lions. Unfortunately, after a Winnipeg onside kick failed to travel the requisite 10 yards forward before being recovered, BC Kicker Paul McCallum closed out the game and the Bomber’s hopes with a late field goal. The Bomber offence in the Grey Cup was not the same run-heavy attack the league was exposed to in the frigid East Final the week prior. Running back Chris Garrett had only eight touches out of the backfield, due in most part to getting behind early in the game. Winnipeg’s inability to sustain drives on offence allowed the Lions to win the battle for field position, consistently giving BC short fields and forcing the Bomber defence to stay on the field longer then they should have. The offence dug a hole the team could not climb out of, and “spotting” any team — particularly the heavily favoured BC Lions — double-digit points early in the game does not typically lead to consistent success in any league. With the Grey Cup loss in the rear-view mirror, the Blue Bombers head into the offseason, after completing a mostly successful run, with some glaring needs on the offensive side of the ball. There has been much debate about Buck Pierce’s play at quarterback. 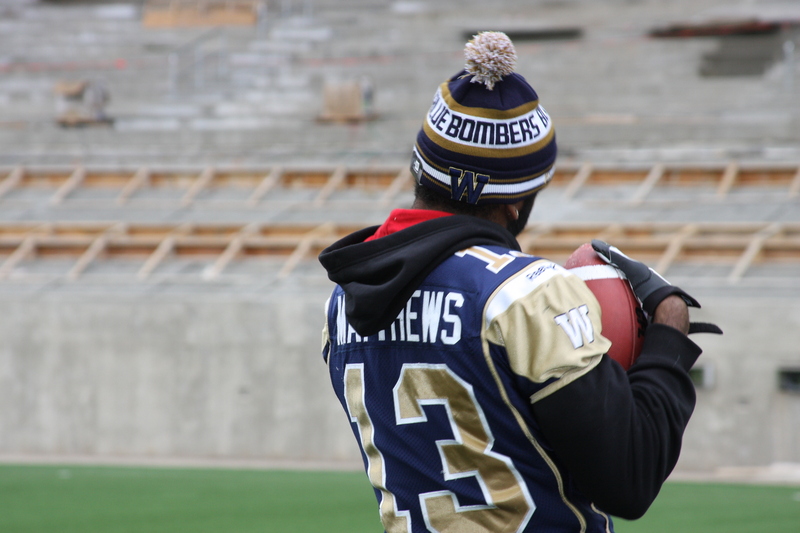 Despite his shortcomings, it appears the Bombers will keep Pierce at centre stage, while Alex Brink and Joey Elliott remain in the picture to step in during the 2012 training camp and take over the struggling offence. Pierce has taken a lot of heat for the offence’s miscues, but a lot of that heat can be redirected at the offensive play calling. The immediate departure of offensive coordinator Jamie Baressi after the Grey Cup loss should hopefully lead to head coach Paul LaPolice letting go of the play calling duties on offence — a big step towards establishing consistency on that side of the ball. With the talented group of youngsters the Blue Bombers brought in this year — import running back Chris Garrett, Canadian wideout Corey Watson, and import receiver Clarence Denmark — there should be plenty of pieces for the new offensive coordinator to scheme with over the offseason. How the Bombers deal with the loss of defensive tackle Doug Brown and the plethora of free agents on the offense will likely shape the Bombers offseason. Fresh off winning the Eastern Division title, simply retaining core players and continuing to build chemistry within the organization may be the key to success going into 2012. If the Bombers can create a sustainable offence to pair with the leagues best defence, Winnipeg fans may have plenty to cheer for in the new stadium next season — and might very well see the Bombers back in the Grey Cup next year.